Preheat oven to 350 degrees F and prep 2 round cake pans. In a small sauce pan over medium heat, reduce strawberries to a thick sauce. Once warm, smash the strawberries with the back of a fork or potato masher. Let simmer for 5 to 10 minutes. Meanwhile, in a large bowl whisk together flour, baking powder, and salt. Set aside. In the bowl of a stand mixer, beat together butter and sugar until light and fluffy. Add in the eggs one at a time, then mix until fully incorporated. Scrape down the sides of the bowl then mix in the vanilla. Measure 1/2 cup of the strawberry concentrate and mix with the milk. Add in 1/4 of the flour mixture to the butter and egg mixture. Mix until combined. Pour in 1/3 of the strawberry-milk mixture and mix until combined. Repeat until all the dry and wet ingredients have been incorporated, ending with the remaining dry ingredients. 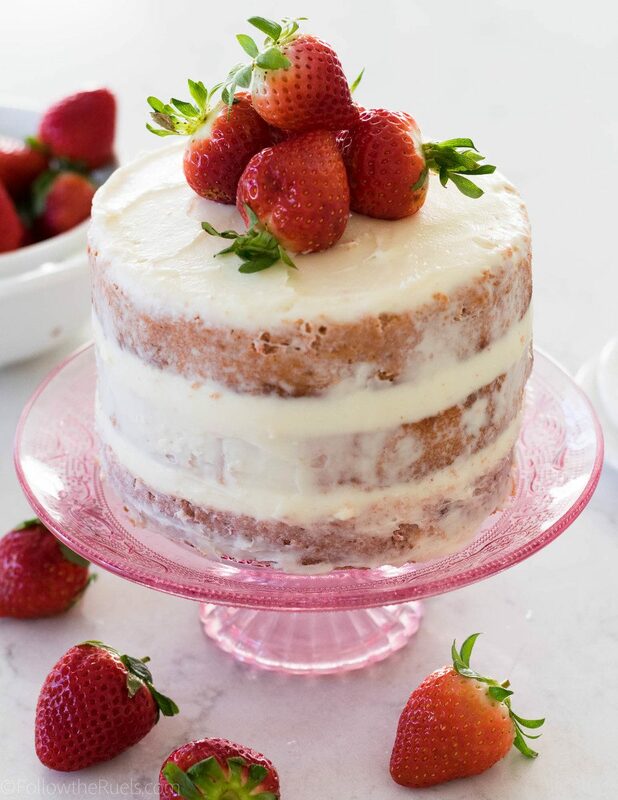 Pour the batter into the prepared cake pans, and bake for 20-25 minutes, until a toothpick poked into the center of the cakes comes out clean. Let cool completely before removing from pans. Then frost and serve as desired.